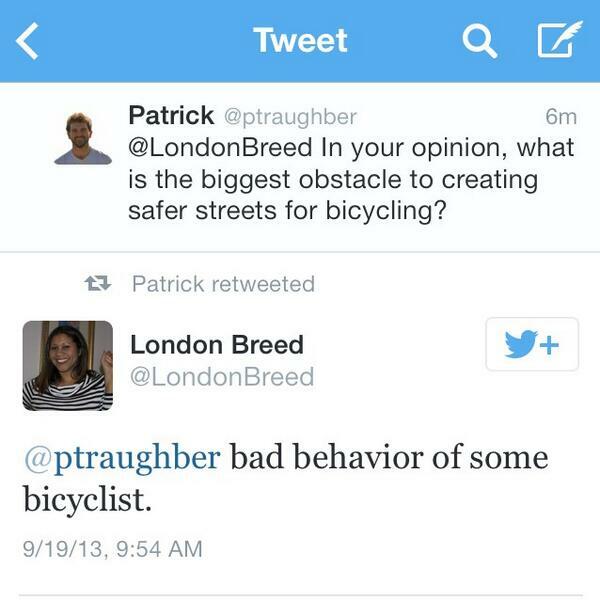 In response to a Twitter inquiry this morning about what she deems to be “the “biggest obstacle to creating safer streets for bicycling,” D5 Supervisor London Breed blamed “the bad behavior of some bicyclist” [sic]. She then argued with several Twitter users before suddenly deleting her Twitter account. Mike Sonn got a screenshot of the initial tweet “in case she deletes it” (quick thinking), as well as [update below] some of Breed’s follow-up tweets. 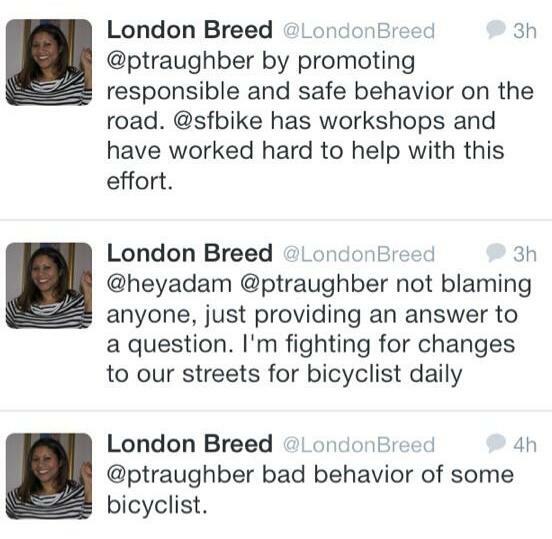 Breed said that she was just being honest, and argued that when she goes to community meetings about street safety, “they’re all about bad biking behavior,” which she has trouble defending. The underlying assumption in this argument is that cycling is an activity for a distinct class of people, rather than just a way of getting around. According to this way of thinking, the city cannot implement proven redesigns that make streets safer for the general population until this “class” exhibits suitable behavior. Imagine if you applied the same logic to car infrastructure: No highway or garage would ever be built until we sorted out all the speeding, failure to yield, and distracted driving that kills thousands of Americans each year. Lumping “cyclists” together as a class fails to consider the large number of San Franciscans who say they’d ride a bike more if streets were made safer. The perceived bad behavior of some people who already ride bikes should not dictate whether we make streets safer for mothers, kids, and all San Franciscans. It’s very disappointing to hear this sort of nonsense from the supervisor who took credit for expediting the installation of the protected bike lanes on Fell and Oak Streets. That (still incomplete) project has provided a safer, more inviting route for District 5 residents who might otherwise feel too intimidated to hop on a bike. As for the actual barriers to safer streets for bicycling, a more accurate answer would be the lack of political leadership at City Hall to stand behind street safety redesigns and prioritize funding for bike infrastructure. London Breed – so do you want me to lie like most politicians?